Pattaya police have set up a fund to cover medical expenses for one of 10 Russian tourists injured in a collision between their baht bus and a pickup truck whose driver became a fugitive after fleeing the scene. Nattaporn Klinhom, 20, is being sought for crashing his white Chevrolet Colorado into the back of a parked pickup-truck taxi around 10 p.m. Dec. 1 on Sukhumvit Road near the Soi Chaiyapruek intersection. He fled the scene, leaving both his truck and two injured passengers behind. 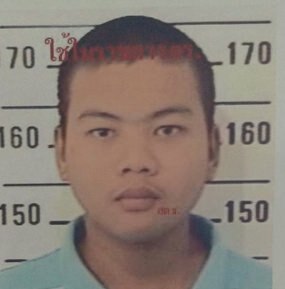 Police searched his local address and registered home in Ayutthaya, but have yet to locate him. Police are looking for Nattaporn Klinhom, 20, for crashing his white Chevrolet Colorado into the back of a parked songthaew around 10 p.m. Dec. 1 on Sukhumvit Road near the Soi Chaiyapruek intersection. Baht bus driver Apichai Kwanmuang, 56, said he was waiting at a red light when the Colorado smashed into the back of the songthaew. Ten Russians he was taking back to the Ambassador City Hotel were hurt, with some thrown from the truck and one, Mikhail Kuznetsov, 27, nearly losing a leg. He had been standing near the back platform that was destroyed in the crash. Three Thais, including a motorcyclist, also were injured in the crash. Kuznetsov’s wife, 27-year-old Elena Naydina, went to the Pattaya Police Station with an interpreter and Russian cameraman to put pressure on authorities to capture Nattaporn and provide compensation for the crash. Naydina said her husband was hospitalized and underwent surgery at Bangkok Hospital Pattaya, with medical bills already totaling more than 455,000 baht. She had paid 300,000 baht, but was short the rest. The Interior Ministry’s newly formed Tourist Assistance Foundation had donated only 10,000 baht. Pattaya police superintendent Pol. Col. Supathee Bungkhrong updated her on the status of the investigation and said police would set up a fund for people to make donations to cover the medical bills.